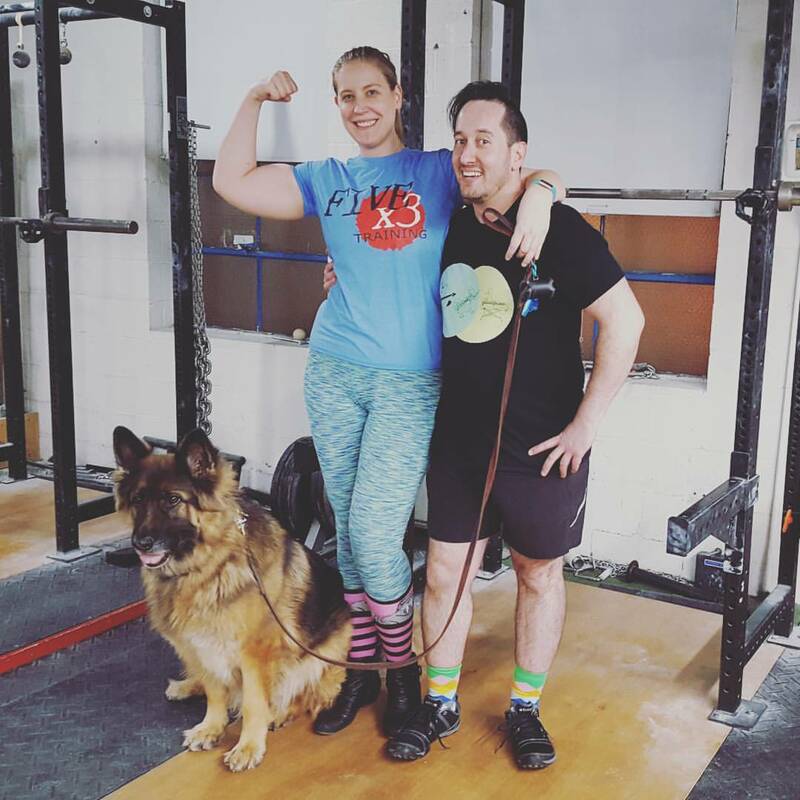 Brendan and his wife, Mariza, and their child, Boomer, at the gym. Brendan here. We’ve never met but I feel like I know you with how much Mariza raves about you. Also, I helped Shannon with the audio on that short she made about you a while back, so I have to say I’m very impressed by you and 5×3. Anyway, I’m writing because I’d like to get in better shape and I think 5×3 might be the ticket. I don’t know to what extent Mariza has filled you in, but a few years ago I developed a rare medical condition that completely derailed my existing fitness regimen. I won’t bore you with the details, but suffice it so say it has been difficult. I was an avid runner who was averaging about 20 miles per week, and was also doing a fair amount of lifting (although nothing like power lifting). Over the last few years I have made various lifestyle and dietary changes that thankfully have tamped this thing down to a dull roar. I’m now cautiously optimistic that maybe, with the help of a professional like yourself, I could (carefully) begin a new fitness program. I am looking to be stronger and feel better, both mentally and physically. I assure you I am no wuss, and am ready to get to work. So, of course, I immediately emailed him back. Anything for Mariza!! 😉 Brendan came in and we discussed his condition, what has worked, what hasn’t worked and I did a little research on my own about his condition. We started slowly and within weeks, Brendan was feeling great. If there were any flare ups during this time, they were very small and not enough for him to be concerned. Now, a year later, it is quite clear that Brendan has discovered a way to not only control his condition, but also get stronger and feel better, physically and mentally. My younger brother was the one who first got me into strength training–although I’m not sure I would call what I did back then “training”. He was kind of a heavier kid back in high school, and I guess, like a lot of heavy kids, he watched the movie “Pumping Iron” (with AH-nold!) and got inspired to transform his physique. I was impressed by his progress and probably out of a sense of brotherly competition, I decided to start lifting as well. Back then I was doing a lot of goofy nautilus machine stuff (yuck!) and hadn’t yet learned good technique or proper programming. 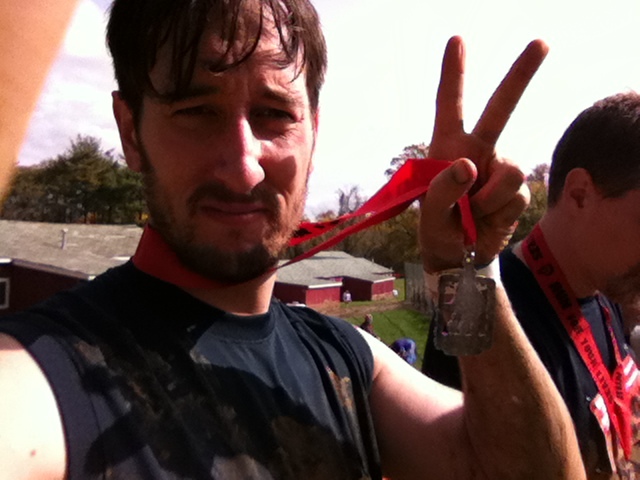 It was all pretty haphazard, but in spite of that I came to enjoy it and made some decent gains on my own. However, in my mid-thirties, seemingly out of nowhere, I started experiencing some pretty difficult setbacks to my health and had developed a condition called “interstitial cystitis” (say THAT three times fast). It’s not a well-understood disorder and as such has no effective treatment or cure. Basically, it feels like a urinary tract infection that never goes away, only it’s not an infection. Some think it may be a type of auto-immune disorder, similar to Chrohn’s disease, except occurring in the bladder rather than in the stomach or intestines. It leaves me in, more or less, chronic pain. Thankfully, there were periods where it was just a minor discomfort, but at other times, it was bad enough that I found I would have trouble concentrating on simple tasks or carrying on normal conversations. Psychologically, I was pretty devastated when I first developed it. Certain physical activities, like my running, seemed only to inflame or exacerbate my symptoms. It got to the point where I basically had to give it all up. For me, it was a double whammy, because here I was severely depressed from having to live with the chronic pain of this disorder, and I couldn’t even resort to my go-to mood-booster, which this point, had been running. I tried to keep doing occasional lifting on my own at my old gym, but that too seemed to make things worse, so eventually I gave that up as well. In spite of all this, I did my best to carry on, because really, what else can one do? A few years later, towards the end of 2016, my fiancee (now my wife) suggested that I try her gym. 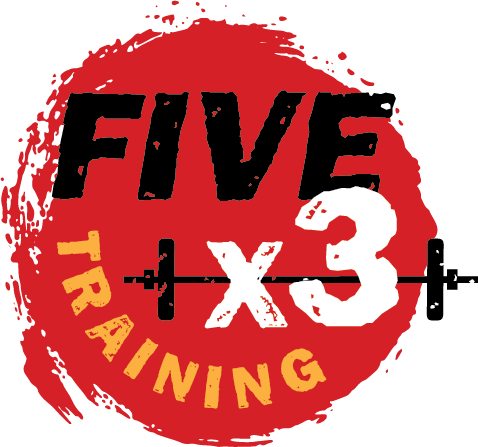 Mariza had been training at Fivex3 Training since 2012 and thought that the Starting Strength program would be a good fit for me and could help me with my issues. 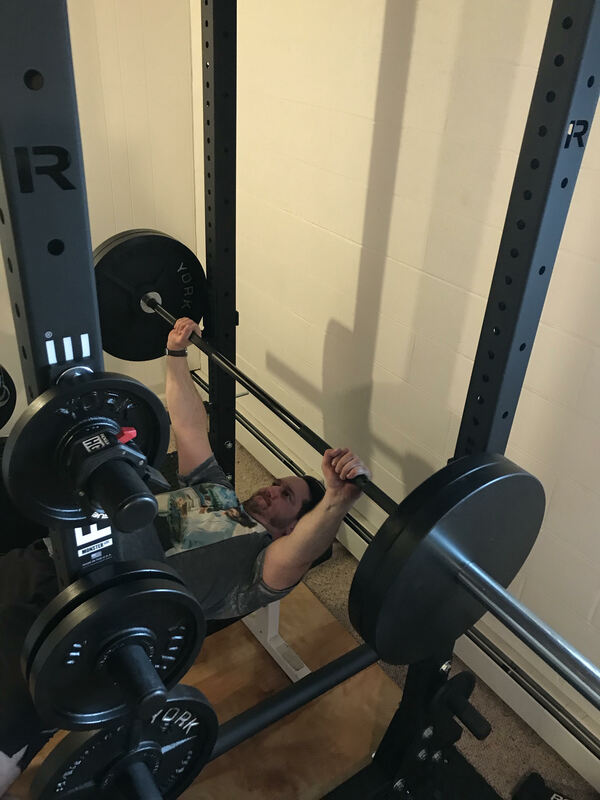 We discussed it and reasoned that, unlike the other physical activities I’d done before, the compound lifts keep the body more or less static and don’t jostle one around as much as other types of exercise like running, etc. The idea seemed sound enough, so I contacted Emily and cautiously gave it a try. I began training in January of 2017 and Emily was very conservative with her coaching and would periodically check in with me to make sure I was not having any flare ups. I was very happy to find that not only did the strength training not aggravate my symptoms, but at times, I started to feel better. I still had my bad days, but at least the program allowed me to get back on the exercise wagon, and as a result, I have gotten stronger in the process. For me, one of the biggest benefits of strength training was mental. Chronic pain can make you feel powerless, like you’re wasting away and you can do nothing to stop it. Seeing those numbers going up every time you walk in the gym and knowing that you’re literally creating a stronger more capable body goes a long way toward beating back that negative mindset. In addition to no longer living with chronic pain, my daily living has improved quite a bit. I tend to notice the difference mostly when I go to lift something/move something around the house that I haven’t done in a while and say to myself, “Wow, I remember that being a LOT heavier the last time I tried that!” I’m sure many others who lift have similar experiences–it just makes getting around and doing things on planet earth a lot easier. 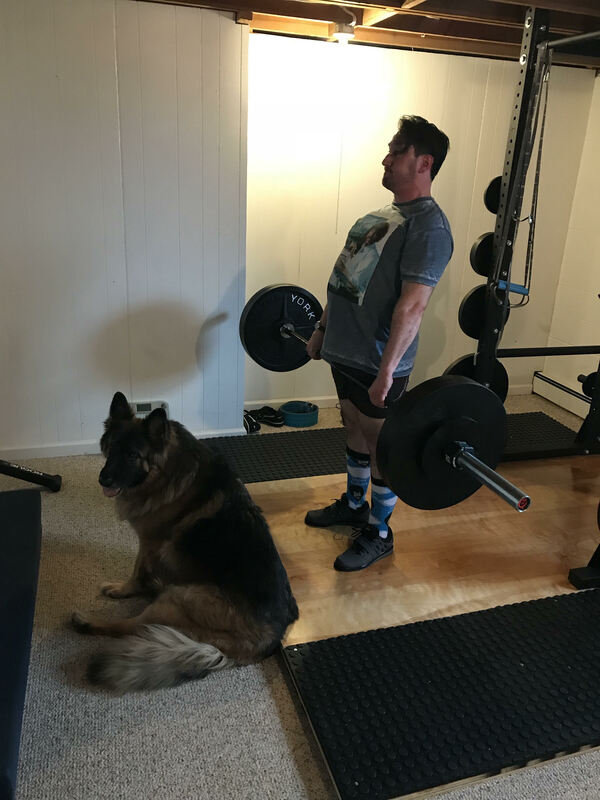 Recently my wife and I moved into a new home, and the fact that we’re both physically strong people has made the moving process–lugging stuff around, moving furniture, etc., so much easier and less fatiguing. Historically, I’ve been somewhat of an insomniac, but when I’m getting my lifts in consistently, I sleep better, have more energy, and am generally much better better at forming coherent sentences. Mariza and I moved recently (which is why we are now “former” clients) but we are very excited because there’s space in our new place for a power rack. We built our own platform to make sure we can continue with our program and not lose our gains! This should tell you something about how much we like the feeling of being strong. My posture has also improved quite a bit, and I tend to stand more upright. I also notice that I seem to be able to get up stairs a little easier. In general, I just feel “strong all over,” a feeling I haven’t felt with any other program I’ve ever done before. I’m way more active than I was three years ago, and I actually thought I’d pretty much lost the ability to exercise at all, but now I know that’s simply not the case. For me, the thing I like most about strength training isn’t about PRs really, but rather all the things it does for me outside of the gym. Don’t get me wrong, like everyone, I enjoy seeing those numbers go up, but more importantly, I like that it makes me feel healthier, stronger, and more in control of my life. And who couldn’t use a little more of that?